Parrots are famously talkative, and a blue-fronted Amazon parrot named Moises—or at least its genome—is telling scientists volumes about the longevity and highly developed cognitive abilities that give parrots so much in common with humans. Perhaps someday, it will also provide clues about how parrots learn to vocalize so well. 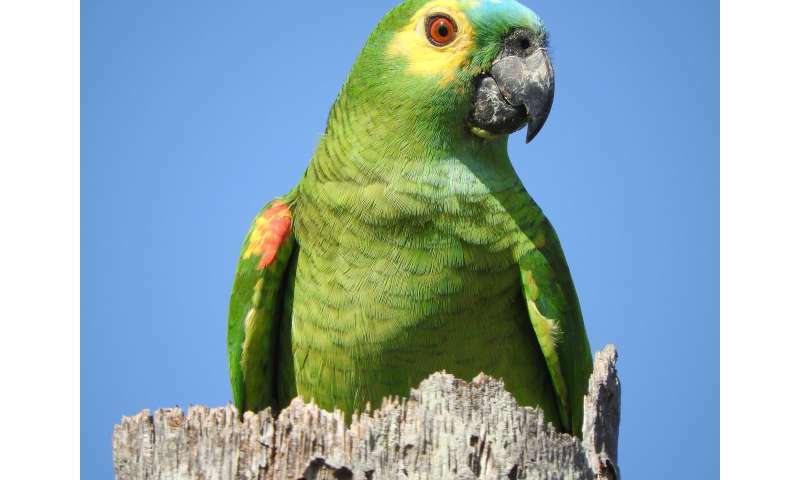 By comparing the blue-fronted Amazon with 30 other long- and short-lived birds—including four additional parrot species—she and colleagues at Oregon Health and Science University (OHSU), the Federal University of Rio de Janeiro and other entities identified a suite of genes previously not known to play a role in longevity that deserve further study. They also identified genes associated with longevity in fruit flies and worms. Wirthlin, who began the study while a Ph.D. student in behavioral neuroscience at OHSU, said parrots are known to live up to 90 years in captivity—a lifespan that would be equivalent to hundreds of years for humans. The genes associated with longevity include telomerase, responsible for DNA repair of telomeres (the ends of chromosomes), which are known to shorten with age. Changes in these DNA repair genes can potentially turn cells malignant. The researchers have found evidence that changes in the DNA repair genes of long-lived birds appear to be balanced with changes in genes that control cell proliferation and cancer. The researchers also discovered changes in gene-regulating regions of the genome—which seem to be parrot-specific—that were situated near genes associated with neural development. Those same genes are also linked with cognitive abilities in humans, suggesting that both humans and parrots evolved similar methods for developing higher cognitive abilities. "Unfortunately, we didn't find as many speech-related changes as I had hoped," said Wirthlin, whose research is focused on the evolution of vocal behaviors, including speech. Animals that learn songs or speech are relatively rare—parrots, hummingbirds, songbirds, whales, dolphins, seals and bats—which makes them particularly interesting to scientists, such as Wirthlin, who hope to gain a better understanding of how humans evolved this capacity.